"Council recognises the devastating impact plastic pollution is having on our environment and the escalating costs of recycling such materials. Council acknowledges we must lead by examples, step up our own efforts and encourage others to follow suit. 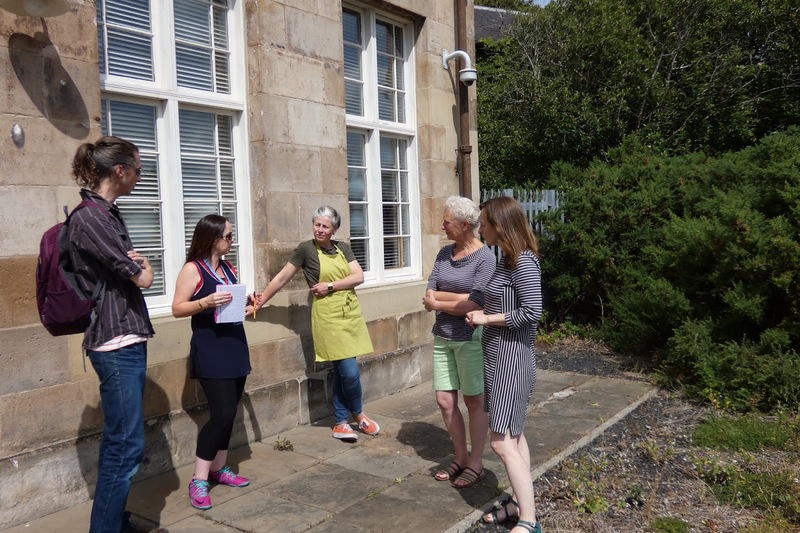 Fife Council will begin by transitioning away from single-use plastics commencing at Fife House and Rothesay House, Glenrothes." 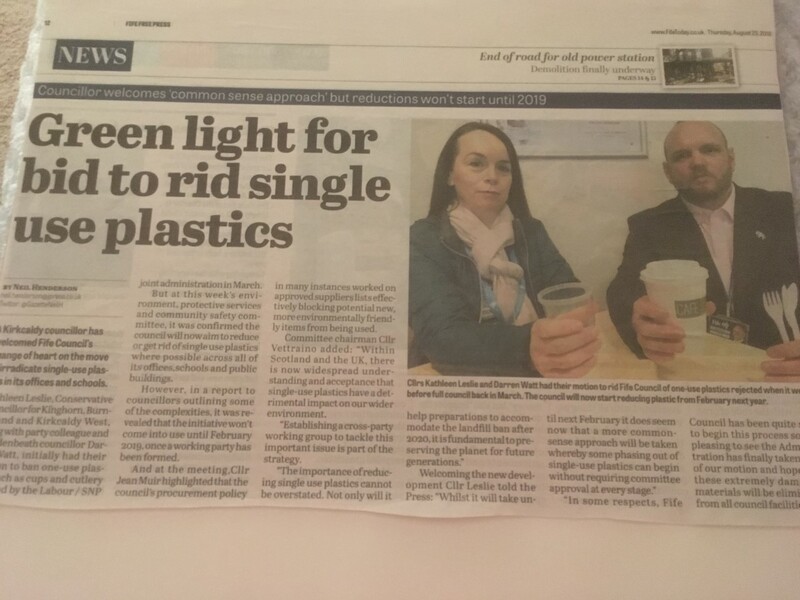 Both myself and Cllr Watt spoke of the devastating impact that single-use plastics are having on our environment, in particular to marine life. We both emphasised that in line with other public bodies, restaurants, schools and businesses up and down the country, there should be a gradual transition away - our belief was to begin this process at the two main Council buildings in Fife. Disappointingly (but unsurprisingly) the SNP-Labour coalition produced an amendment and voted down our motion. We had hoped to gain cross-party support but their unlikely alliance instead did not accept our proposal and instead comments were made about jobs would be lost and other dramatic remarks. 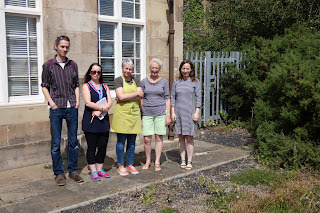 However, we were very encouraged to discover that the Environment Committee took on board what we had said and a recommendation was moved for Council to begin this process, looking at procurement, the places where it may not be so easy to be rid of single-use plastics and a more sensible approach in that products such as plastic cups could be gradually eliminated. Ultimately this move came about due to the motion to Council in March - myself and Darren brought the issue to the attention of members, took a pragmatic approach which addressed both the urgency to act but the understanding that this would be a steady transition. Imagine my surprise then when I opened this week's Fife Free Press and noted that a Labour councillor - who incidentally did not express a single word of opinion in the Council Chamber on this subject, criticise us for expressing our delight that his SNP-Labour coalition had finally reacted and realised that Fife Council is really no different to anywhere else and people are keen to transition away from single-use plastics. We did not reject his SNP-Labour coalition's motion because there was no motion to reject. They put up an amendment to our motion. We voted for the motion they, predictably voted for the amendment. Therefore, it is inaccurate, misleading and downright false to suggest that we voted against their motion. A motion and amendment is not the same thing, I (wrongly?) assumed councillors were aware of this. The Conservative group at Fife Council took the lead on this and myself, as someone who has for many years now been a strong advocate of recycling, the elimination of single-use plastics and a higher tax on polythene shopping bags, do not accept such utter nonsense being spouted. 231 schools are still searching for teachers, some with multiple vacancies. 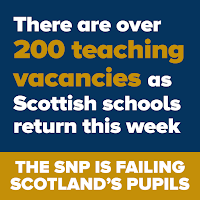 Scotland has 3,400 fewer teachers than it did in 2007 (the year the SNP came to power), couple this with the GP crisis, shortage of nursing staff, lack of police and it really doesn't look great. 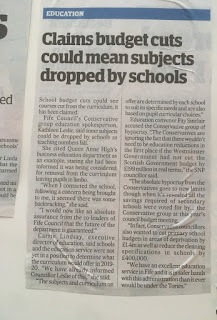 Whilst claiming education was their "number one priority" - the oft repeated but looking rather hollow, mantra of the SNP Government at Holyrood, the reality is somewhat different. Instead of building and developing a workforce we see a decrease in teacher numbers, a fall in the number of ASN teaching staff, decreased subject choices in S4, a huge reduction in those taking qualifications in modern languages, a cap on university places for Scottish students, cuts to college places, increased bureaucracy and moves towards centralisation of education - although the Education Bill is currently on (indefinite?) postponement (the list goes on...). 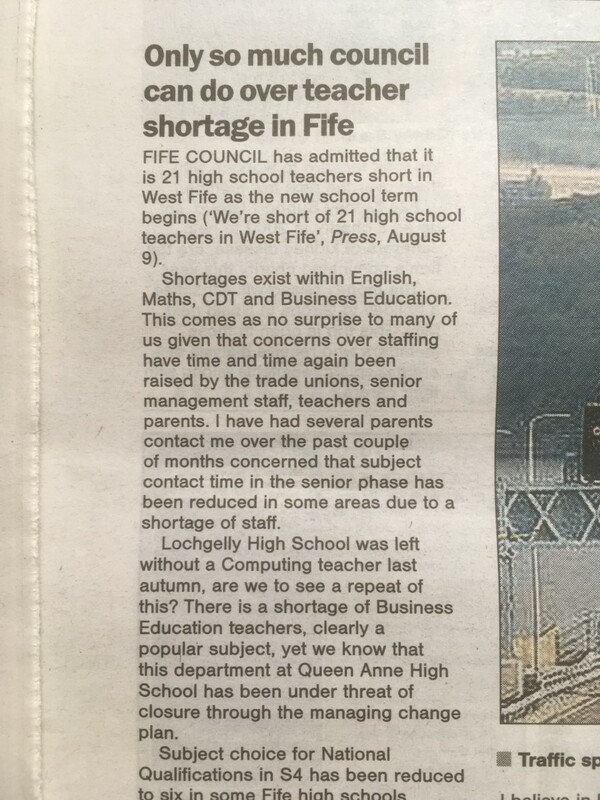 The following article highlighting the shortage appeared in the Dunfermline Press. In response I wrote a letter (see below). 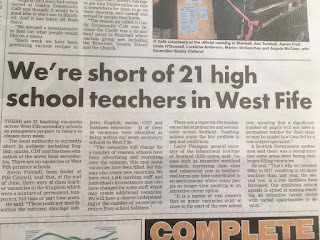 Fife Council has admitted that it is 21 high school teachers short in West Fife as the new school term begins (DP 9/8/18). Shortages exist within English, Maths, CDT and Business Education. This comes as no surprise to many of us given that concerns over staffing have time and time again been raised by the trade unions, senior management staff, teachers and parents. I have had several parents contact me over the past couple of months concerned that subject contact time in the senior phase has been reduced in some areas due to a shortage of staff. 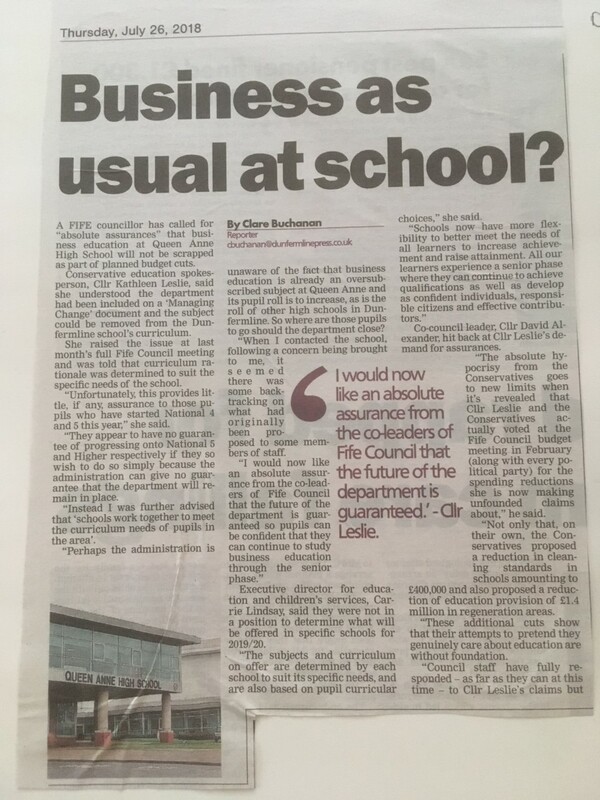 Lochgelly High School was left without a Computing teacher last Autumn, are we to see a repeat of this? There is a shortage of Business Education teachers, clearly a popular subject, yet we know that this department at Queen Anne High School has been under threat of closure through the managing change plan. Subject choice for National Qualifications in S4 has been reduced to six in some Fife high schools, particularly those in the most deprived areas. Meaning those who want to leave school earlier will have fewer National qualifications and those who stay on for Highers are limited in the options they have. 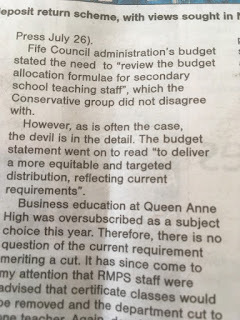 Fife has done much to attract teachers to the local authority over the past few years but there is only so much the Council can do. 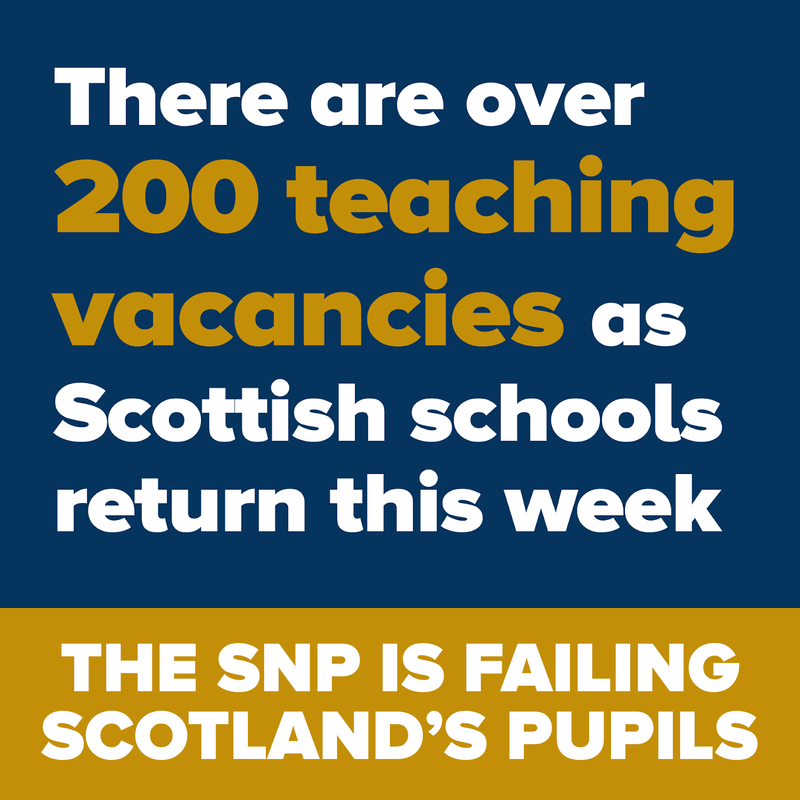 Scotland has 3,400 fewer teachers than it did when the SNP came to power in 2007 and the new academic year begins with almost 700 positions across the country being unfilled. 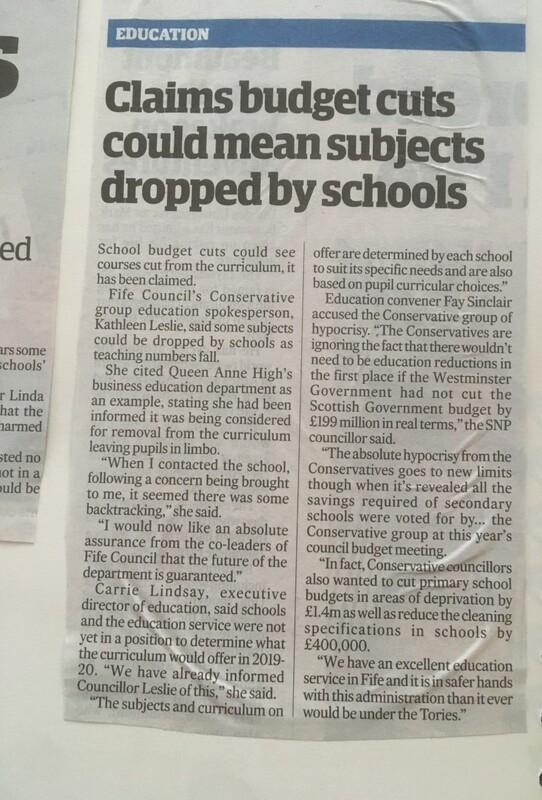 The claim that education is the “number one priority” for this SNP Government is beginning to look rather hollow. 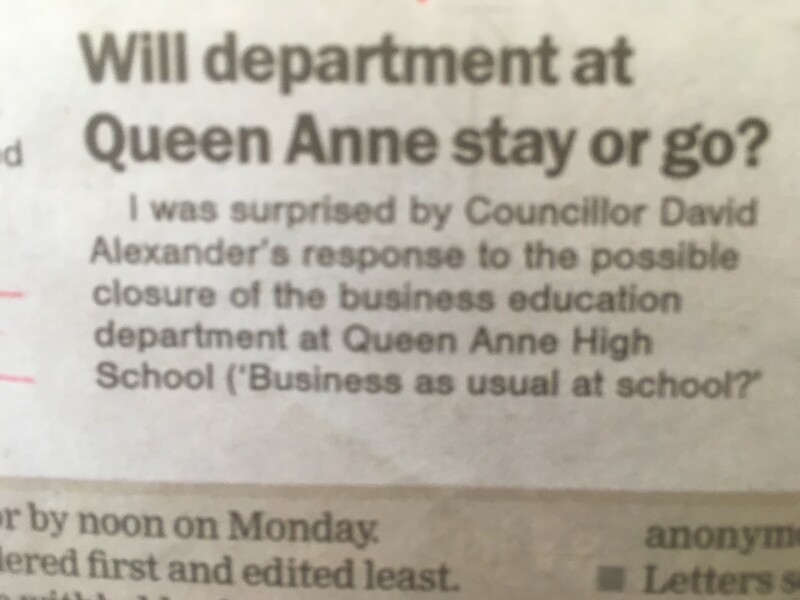 Can the Administration confirm that there are no plans to close the Business Education Department at Queen Anne High School at the end of the school session 2018-2019? Neither the schools, nor the Directorate, are in a position, yet, to determine what the curricular offer available in a school for session 2019/20 will be. Curriculum rationale is determined by each school to suit its specific needs and is also based on the curricular choices of pupils. Schools now have more flexibility to meet better the needs of all learners to increase achievement and raise attainment. However, all learners are entitled to experience a senior phase where they can continue to develop the four capacities and achieve qualifications. Why did I ask this question? I specifically asked this as I was approached by a member of staff who stated that in the school's managing change exercise the Business Education department had been singled out as potentially to close (this managing change exercise is available on the school's website). 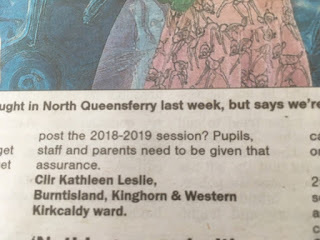 This was despite it being oversubscribed in numbers and meaning that if it was to close at the end of session 2018-2019 (new Autumn term 2019) those pupils studying for a National 4 who wanted to progress to National 5 and those studying National 5 and wishing to progress to Higher, may no longer have that opportunity. Such was my concern that I wrote to Council officers but did not feel I had a satisfactory answer. Looking at the above answer I do not feel it is much more satisfactory. 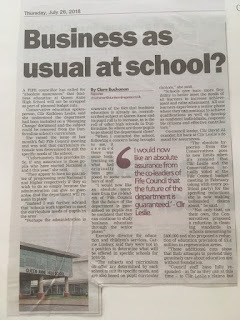 Since this was asked I was contacted by another member of staff who was also aware of the potential closure of the Business Education department and also the possible reduction in options on offer within the RMPS department too. What is going on? 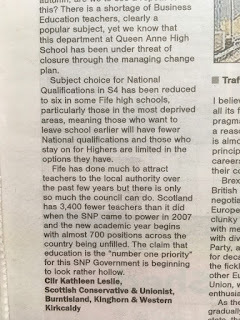 The SNP Government continue to claim that education is their "number one priority" yet we have seen a drop in the number of subject choices in schools across Scotland, a fall in the number of teachers, a fall in specialist teachers (Additional Support Needs and teachers of the Deaf) and the removal of Scotland from some of the international data on standards in attainment. 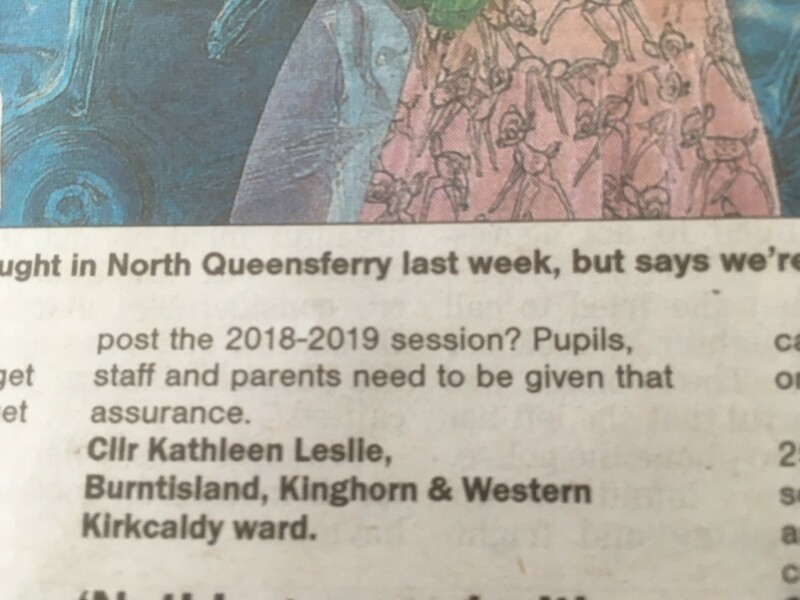 Only last year one school in Fife was left with no Computing teacher (http://www.kathleenleslie.co.uk/2017/08/lochgelly-high-school-what-happens-next.html) and I have been told of at least one other high school in the local authority with a shortage of Computing teachers. Determined to get an answer that would provide assurance that any pupil who wished to continue with their Business Education studies next year I asked the below supplementary question. The answer is less than satisfactory - given the location of the school, the subject being oversubscribed and popular in other West Fife high schools in the Dunfermline area, this answer is simply waffle that says nothing. Can you confirm that pupils will be able to carry on with this subject at higher level? Cannot confirm at present but schools work together to meet curriculum needs of pupils in the area. 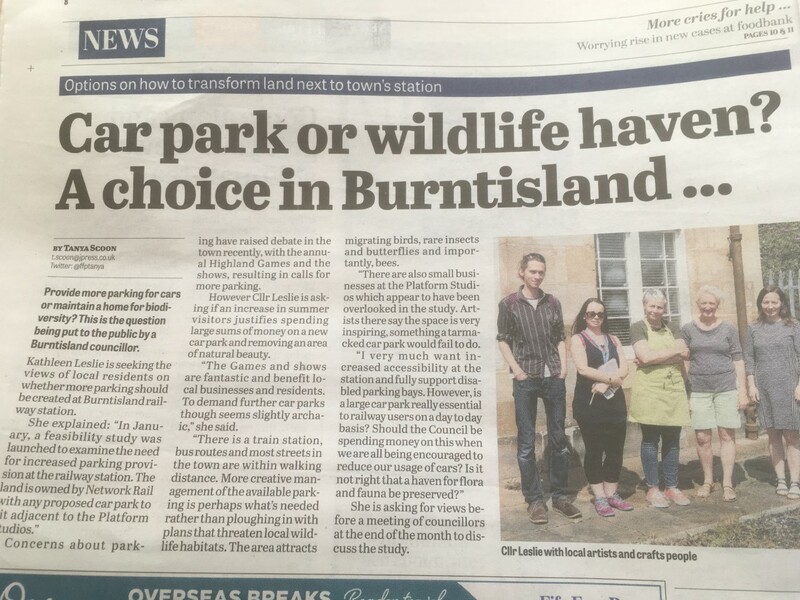 Following the Council meeting there was some press coverage. 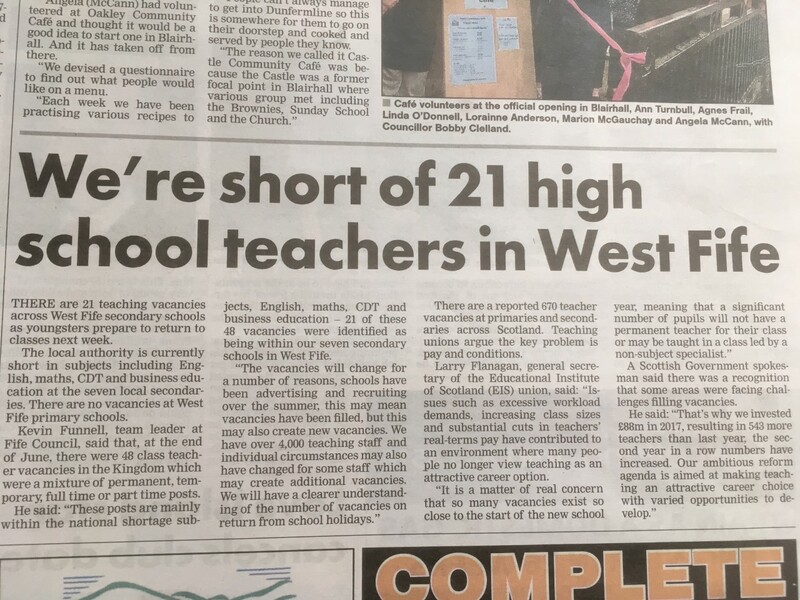 We therefore, appear to be in a situation here in Fife where there is a shortage of teaching staff in some areas whilst at the same time the SNP-Labour Administration - due to a £500 million underspend by the SNP Government at Holyrood, are looking to cut back on departments and staff. I was surprised by Cllr Alexander’s response to the possible closure of the Business Education Department at Queen Anne High School. The Administration’s Budget stated the need to “review the budget allocation formulae for secondary school teaching staff”, which the Conservative group did not disagree with. However, as is often the case, the devil is in the detail. The Budget statement went on to read “to deliver a more equitable and targeted distribution, reflecting current requirements”. Business Education at Queen Anne High School was oversubscribed as a subject choice this year. Therefore, there is no question of the current requirement meriting a cut. 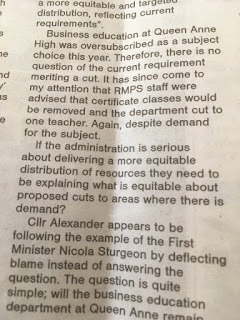 It has since come to my attention that RMPS staff were advised that certificate classes would be removed and the department cut to one teacher. Again, despite demand for the subject. If the Administration is serious about delivering a more equitable distribution of resources they need to be explaining what is equitable about proposed cuts to areas where there is demand? 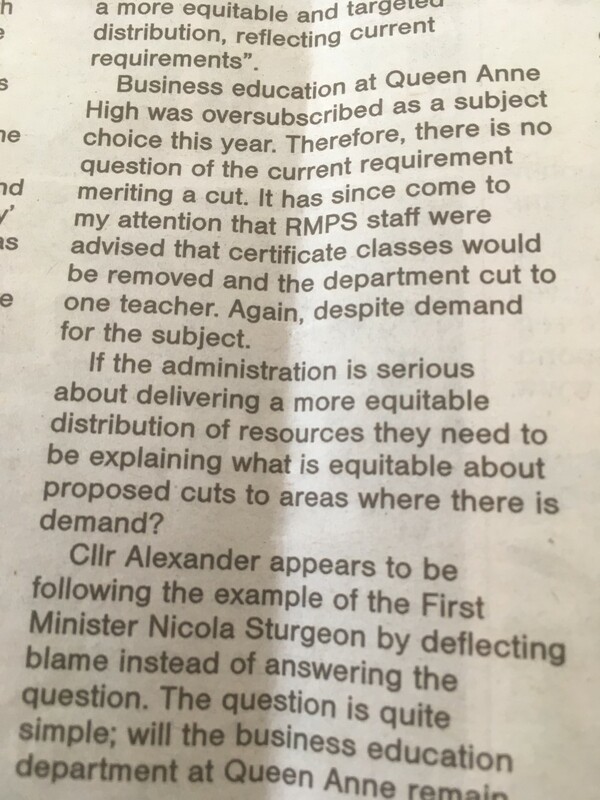 Cllr Alexander appears to be following the example of the First Minister by deflecting blame instead of answering the question. The question is quite simple; will the Business Education Department at Queen Anne High School remain post the 2018-2019 session? Pupils, staff and parents need to be given that assurance. More faux outrage - with the usual SNP mantra "its Westminster's fault". Education is fully devolved and the SNP Government at Holyrood is sitting on a £500 million underspend last year - money that is desperately needed by local authorities for education and other services. Car Park Or Wildlife Haven? 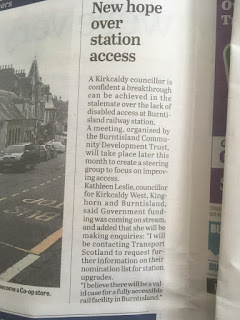 Just over a week ago I was contacted by a concerned resident in Burntisland about a rumour that the area in front of the Platform Studios at the railway station was going to be turned into a (up to 100 spaces) car park. Indeed, there has been a feasibility study carried out. This process began in January of this year after calls by a councillor (not this councillor) that due to issues with parking in the town that the area in front of the studios should be considered as ground for creating up to a 100 space car park. Fife Council being Fife Council, the initial completion date of the study was March but didn't finish until the beginning of this month. 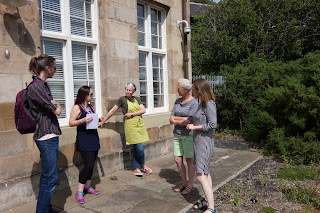 Prior to the outcome of the study I went along for a chat with a couple of concerned residents and happened to also meet and speak with some of the small business owners who rent space in the Platform Studios - part of the historic buildings of the station. What appeared to be an area of scrub land and weeds, to the untrained eye, is in fact buzzing with biodiversity and very much alive. I am a long term critic of almost uncontrolled house-building and development in areas which are farmland and fields. As an environmentalist I have often watched as bulldozers set in and wonder how many rabbits, hedgehogs, foxes, badgers and nesting birds (and so much more) are swept away in the chaos of their homes being overturned. 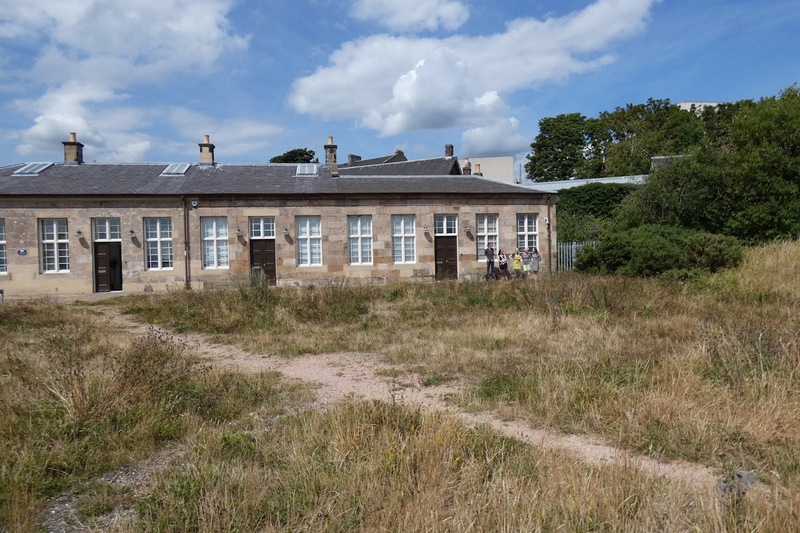 Now it seems that even an area of land sitting between the railway station and the chilly waters of the River Forth (separated by only a road that runs to the sailing club and is favoured by dog walkers along the coast) could be subject to the loss of wildlife space. Wandering around on a hot July afternoon and learning the many names of plants, rarer species of insects and the catalogue of birds - many as part of their migratory route, I was struck by the thought that this is not an area of wasteland but a buzzing habitat that provides space for wildlife that is constantly being subject to loss of land. Bees buzzed around - and no-one can fail to ignore the importance of bees as part of our overall food chain, and I actually spotted a couple of butterflies - anyone else noticed their almost complete absence this year? Following this I had a chat with some of the small business owners - art and jewellery, unique and beautiful pieces and much of it being created due to the inspiring, relaxing and natural environment. As one of the ladies said - how would a car park inspire creativity? Indeed, she is correct. 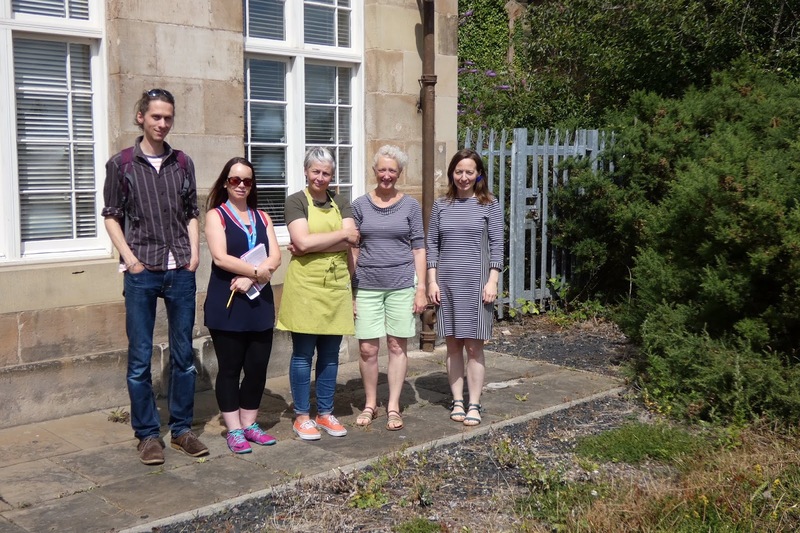 The Platform Studios are leased from Network Rail but in a telling lack of regard for them there is no mention in the Council's feasibility study of what impact there would be on their work and livelihood. Only a mere note of - "It is assumed that the Platform Studios have some form of tenancy agreement with Network Rail." (italics are mine - assumed - really?!). Burntisland has had a long-running issue with parking which once again reared its head with the arrival of the shows and Highland Games. The Council decided that to stop the concerns on games day of parking on the Links it would relocate car and instead have them placed off the side of the Haugh Road (with of course no consultation with residents) and now in an attempt to alleviate this problem which in actual fact should have been resolved a long time ago had the Council taken the matter seriously, a proposal is floating around about turning the area behind the station into a huge parking facility. Keeping in mind that we are talking about increased need for parking in the town in two months of the year. I accept that there is very limited parking at the station but I have not seen the claimed evidence of cars piling up on surrounding streets - despite being out and having a scout around during weekday mornings. 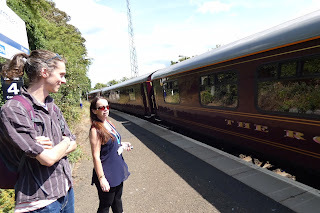 I am also very much pushing for full accessibility at the station which is long-overdue and would very much support additional disabled bays but is it really the best we can do in 2018 - create another car park? 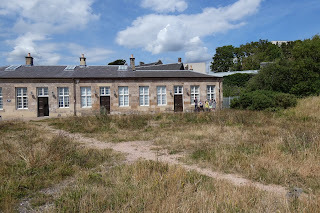 Destroy an area of natural beauty to build a car park in a town where there is a good bus services and commuters can walk or cycle to the station - how about pushing for more bicycle bays? It may be I am wrong and there is a huge demand, if that is the case then lets hear it. Up until now that has not appeared to be the case. I said from the beginning of my election campaign that I wanted to listen and represent local people - therefore, tell me your views. There will be a meeting at the end of this month between Council officers and councillors for the Ward - the more feedback and thought I have the better. Concerns about parking availability have once again caused much discussion and debate in the town with the annual Highland Games and the shows, resulting in calls, from some, for more parking. 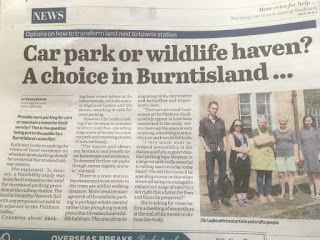 However, Cllr Leslie takes the view that is an increase in visitors over the Summer months a justification for spending huge amounts of money on a new car park and removing an area of natural beauty? How amazing is this? 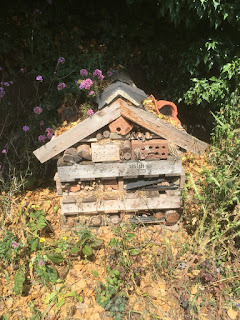 An insect house! Hello everyone. I must apologise for the long delay between posts. I think it must have been this fantastic weather this Summer which has kept me away from writing quite so much. Although, having said that, I have been putting plenty of updates on my Councillor Facebook page, so have a swipe over to it to see what I have been doing. An initial meeting to bring together community groups and elected representatives is to be held later this month. Here is the comment (in full) which I issued as a press release earlier this week. Following contacting Network Rail in April to request a meeting to look at accessibility at Burntisland Railway Station, Cllr Kathleen Leslie is optimistic that progress can be made.